I asked The Hubby through Facebook where he is taking me for dinner on Chinese New Year. He replied simply - jogging. Our friends who read our exchange were all flabbergasted. Jogging? What kind of a date is that? Actually, The Hubby was training for the Condura Run for the Dolphins that week. You know, running or marathon is the new fitness fad in Manila and The Hubby is not one to be left behind. Turns out before I asked where dinner will be, he has made plans to train at the ULTRA (a.k.a Philippine Sports Arena) that night with a few colleagues. So dinner will be after their training or we'd have to reschedule. I decided to go for the 'jogging Chinese New Year date'. I thought it's quite a unique way to welcome the Lunar New Year. Of course I did not run. The Hubby ran around the Oval at least 10 times, effectively completing nearly 5 kilometers, while I watched. Pretty good workout I'd say. Then the most awaited dinner followed. Again, not in the most expected manner or place. 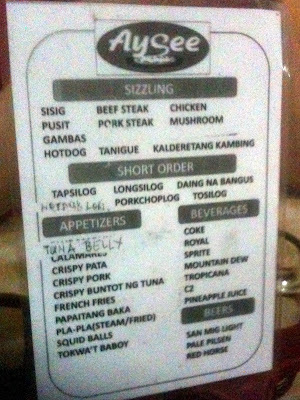 We tagged along his colleagues and went to Aysee Sisig instead of a Chinese restaurant. Was I disappointed? Hell no! Aysee is a small eatery at the back of Ultra, along St. Martin Street. Just a hole in the wall as it seems, this joint boasts of the best sisig in town. But what captured my taste buds was not the sisig, it's the papaitan. 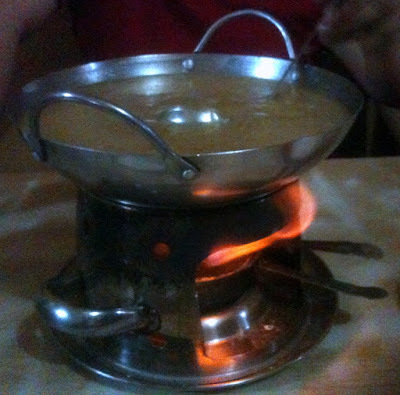 I've never seen papaitan served on top of a burner to keep the soup hot while we eat. It's actually logical because papaitan is commonly served as a pulutan (food to accompany beer or liquor) and take hours before the entire dish is consumed. Apart from the way it was served, that papaitan was the best tasting I've had from a restaurant. Even the one I enjoyed at Burnham Park in Baguio was no match to Aysee's. We ate a lot. Too much I think. The food is so affordable we didn't hesitate ordering second servings. Later we realized the calories the boys lost through running were all gained back in a matter of minutes. Silently I was thinking, 'how about me? I didn't run but ate like a carpenter?'. Anyway, I was too full to worry about weight nor calories that night. 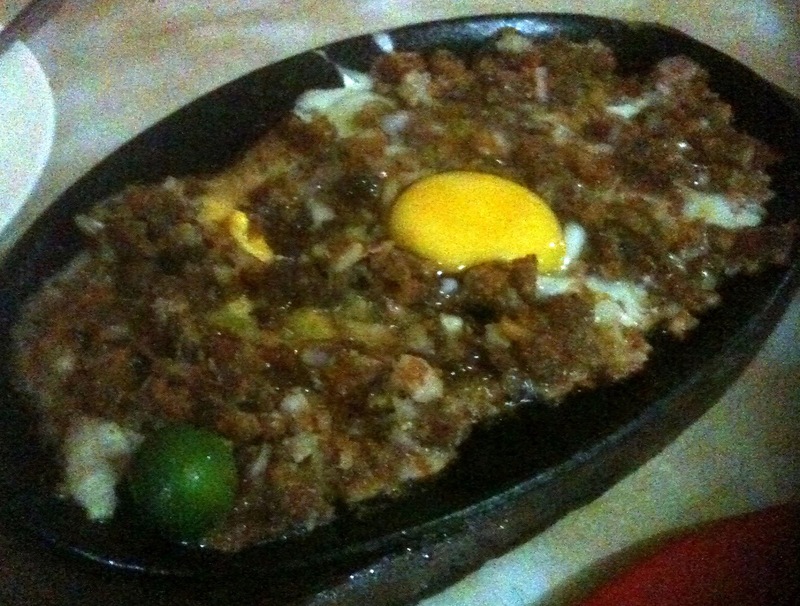 It must be the sisig blocking my brains from sending the 'I am full' signal. So that's how our Chinese New Year date turned out... we had authentic Filipino food to celebrate a very special Chinese occasion. Mangga, Mangga Hinog Ka Na Ba? Who is your child's pedia? Hey Rabbit, come on in! Pay It Forward: Blood Donors Please!